What It's Like: The hardest regularly run section of the Cheak - excellent boating in a good canyon with a few gnarly spots. Class: V at medium levels. 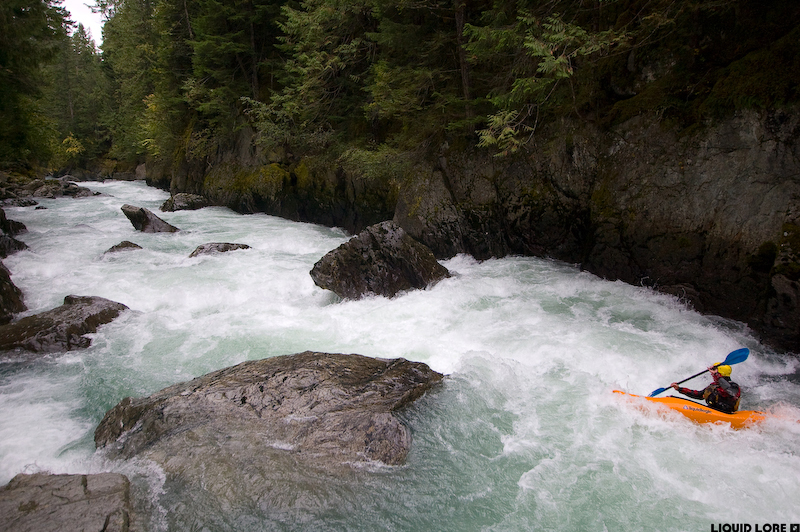 Level: Online gauge: Cheakamus River - the same gauge as the Upper. Much of the flow also comes from Callaghan, which doesn't have an online gauge. When To Go: Early or late season. Gauge info: if you have previous experience on the Cheak, note that the gauge changed sometime before the 2015 season and now reads about 0.1 m lower than it used to. Levels are adjusted appropriately on this page. The Daisy Lake Canyon is the underused section of the Cheakamus between the Callaghan Creek confluence and Daisy Lake. 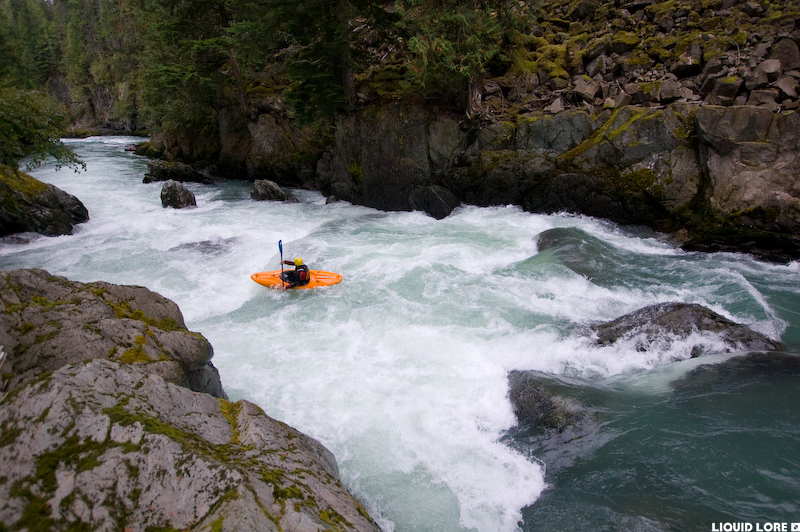 It has a reputation for tough whitewater in a significant canyon - this is definitely true but for boaters up for the challenge it delivers some standout class V whitewater early or late in the season when many other runs are low. 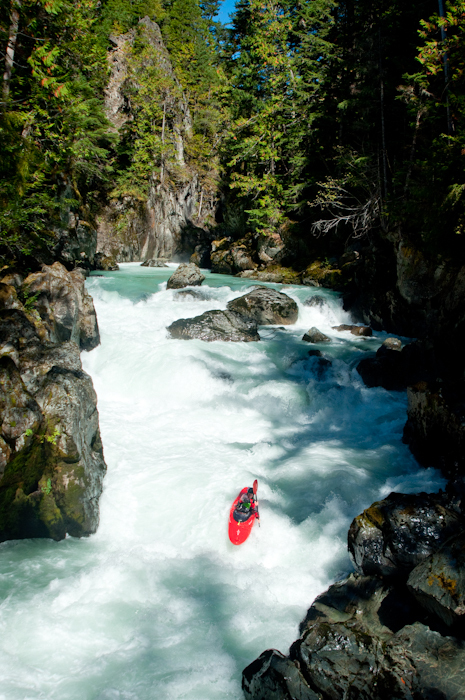 The quality is on par with all the other great whitewater in the Whistler zone so don't let tales of woe scare you off from giving it a go as it's completely reasonable to figure it all out on your own. Flows in the Daisy Lake Canyon are a combination of water from both the upper Cheakamus and Callaghan Creek - the Cheak has a convenient gauge but the flow added by the Callaghan always adds an element of uncertainty to the water level so use that gauge cautiously. The easiest season to gauge the level is in the late summer and fall when the Callaghan has dropped to very low levels. Look for 2.3 on the Cheak gauge for a nice medium level when the Callaghan is low. It's probably fine as low as 2.0. Gauging the level in the spring when the Cheak remains low is difficult as the Callaghan often roars to life before the Cheak starts to rise and groups have put on with the Cheak at around 2 to find the Daisy Lake Canyon at the upper limit of runnable. There are no convenient visual gauges to check the level in the canyon. The put in is at the Callaghan/Cheakamus confluence, where you quickly run the Cal-Cheak down to the head of the canyon. Turning off highway 99 at the Daisy Lake FSR (follow the signs for Whistler Bungee) you can put in at a number of places including the Cal-Cheak campsite or the bridge over the Cheakamus about 1 km from the highway. Alternatively you can start at the Cal-Cheak take out if you know where it is. The take out is randomly along highway 99 just south of the Brandywine Falls Provincial Park. The trail from Daisy Lake comes up to the road where the big transmission line crosses the road at the north end of the lake. There is no parking in the immediate vicinity of the trail - about 500 m to the north is a large pull out where you can easily park. From the confluence down to the canyon is of little consequence. 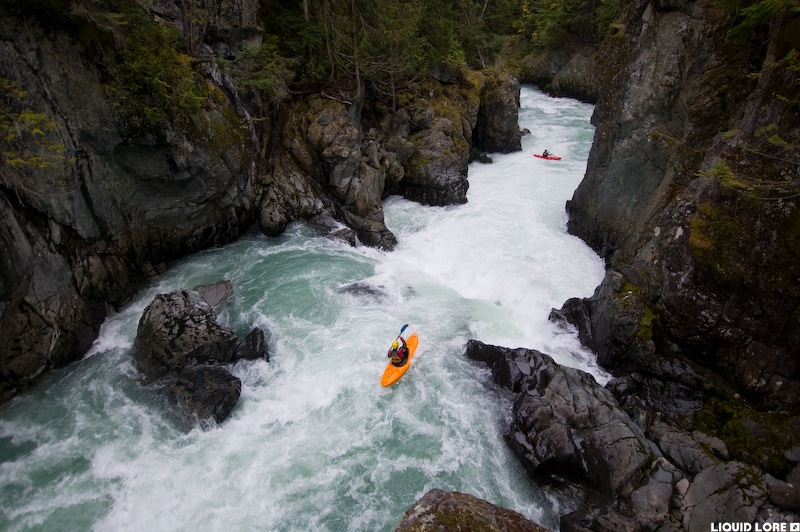 This is a popular intermediate stretch of whitewater and the canyon collects and destroys boats that get lost when people swim. The canyon entrance is obvious and the first rapids are good class IV warm up. The bungee bridge passes over head and the canyon walls get bigger, as do the rapids. 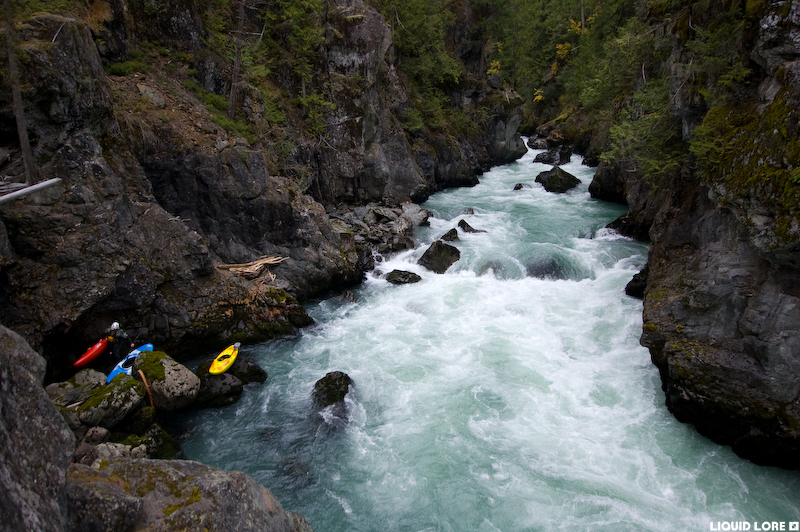 After a large river-wide ledge you scout from high on the right comes a huge V+ rapid that is almost always portaged. It has a busy class III lead in to a small one boat eddy on river left - needless to say tread carefully here. The portage takes about 30 minutes down the left shore. Most people complete this canyon with 2 portages. More big rapids come below here with ledges and continuous sections. As things start to ease off you will all too soon reach the lake - if the lake is low you'll get a few extra rapids. Paddle directly across the lake to the inlet of Brandywine Creek where a short but very steep trail goes up to the highway. Scout it out beforehand as it's hard to find from the water. Enjoy the Daisy Lake Canyon - it's good stuff. The rapid under the bungee bridge. More action near the start. A typical scene in the heart of the canyon. One of the best rapids on the run. A nice rapid immediately after the big portage.